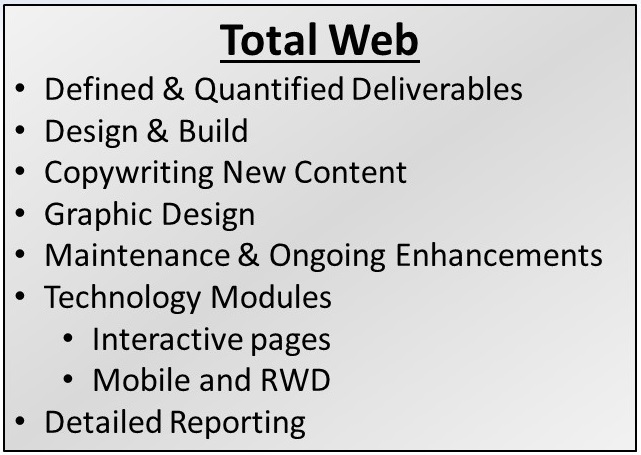 Fast, efficient, and comprehensive TotalWeb Partners Website Design & Build offers include professional design guidance, copy-writing, on-going analysis, and on-going updating from TotalWeb’s professional team. TotalWeb’s staff will learn about your business to create the best possible online experience for your customers on both traditional and mobile devices. No special quoting is required as costing is quick and easy with TotalWeb’s menu driven services for basic sites as well as a full suite of optional modules. TotalWeb Design & Build– Innovative design process for swift implementation with on-going update service. New or upgraded content pages; New Product, New Service, or Case Study 4 / yr. 4 / yr. 4 / yr.
* Terms 50% down, 50% due upon completion.